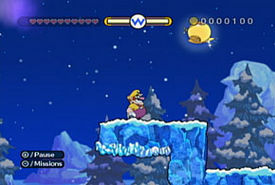 Freezing Fields is a secret level in Quiver Cliffs in the game Wario Land: Shake It! It can be unlocked by finding the secret map in Bamboozle Village. It is another level revolving around snow and ice. Icicles reappear along with Snowman Wario and Snowman Blocks. The background of the level ranges from area. Outside the ice cave part is an aurora with evergreen trees and glaciers. Inside the ice caves, the background is purple colored ice. Common enemies here include Pengoons and Bumbleprods. A new enemy also appears that has a similar appearance to the fire that turns Wario into Flaming Wario. However, these flames are colored blue and will turn Wario into Frozen Wario. The 'Golden Enemy' here is a Floating Bandinero. Once Wario finds the caged Merfle, he will have to slide back to the start before time runs out. In the Japanese version, "scissor-shaped" glaciers can be found in the exterior background. This page was last edited on December 11, 2018, at 18:29.